WWII U.S. 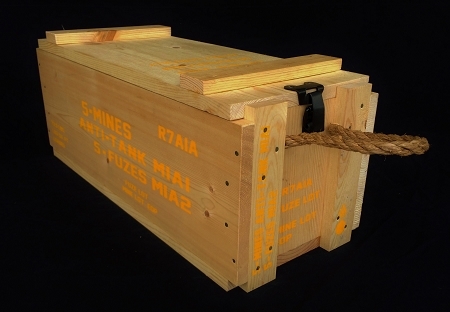 ANTI-TANK LAND MINE CRATE. USED DURING WWII TO TRANSPORT 5 M1A1 ANTI-TANK MINES, AND 5 M1A2 FUZES. MANUFACTURED FROM 3/4" PINE, WITH ALL THE FEATURES OF THE ORIGINAL. ALL JOINTS ARE GLUED, AND NAILED WITH 7CC NAILS. ALL INTERIOR VERTICAL SLOTS ARE PRESENT, WHICH HOLD THE INTERNAL DIVIDERS. WE FAITHFULLY REPRODUCED ALL THE METAL HARDWARE FOR THESE CRATES, A FEATURE NONE OF OUR COMPETITORS PRODUCTS FEATURE. PERFECT FOR VEHICLES, CAMP, AND TO ENHANCE YOUR LIVING HISTORY DISPLAY.